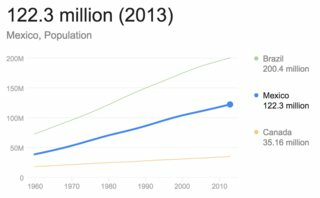 America has already taken in one-fourth of Mexico's entire population. 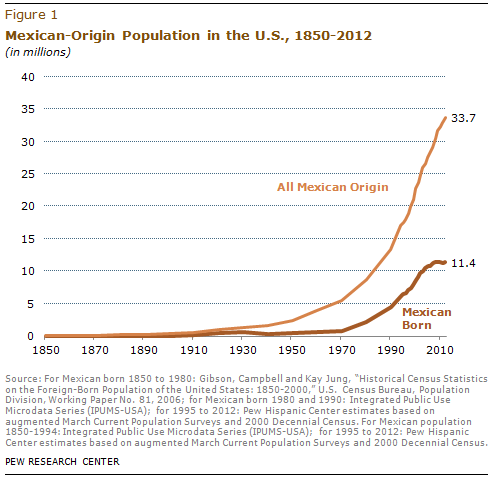 In 2013, data suggests that the Mexican population is estimated at 122.3 million mexicans. 25% of 122.3 million = 30,575,000 million immigrants. So, the claim is that there are 30m mexican immigrants in the States. Is it true? A record 33.7 million Hispanics of Mexican origin resided in the United States in 2012, according to an analysis of Census Bureau data by Pew Research Center. This estimate includes 11.4 million immigrants born in Mexico and 22.3 million born in the U.S. who self-identified as Hispanics of Mexican origin. You should note here based on the definition of immigrants; 22.3 million people who are born in the U.S. from a Mexican origin are not immigrants. The would mean there 33.7 million Hispanics of Mexican origin in the US but only 11.4 million are considered immigrants (born in Mexico). Has Obama or any other US President authorized the assassination of US citizens? Is one guilty until proven innocent in the Mexican legal system? Did 9% of the US population decide our presidential nominees are going to be Clinton and Trump? Have ATMs across the US “spat out money” in the second half of January 2018? Have unions destroyed the US automobile industry?